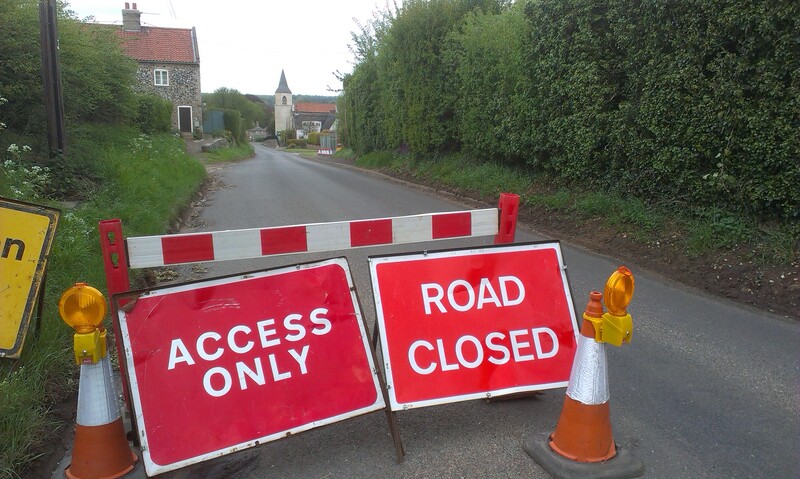 I checked up on Regional Route 30 from Weeting to Thetford today. The route and signs were all fine, though I did notice one issue that I hadn’t spotted before. When the street lamps were replaced in the area around the Brandon level crossing, it seems that one of the new columns (labelled “1 Brandon Road”) was placed within an already narrow section of cycle path. The width between the post and the painted white line is now only about 75cm, and the width from the post to the edge of the curb is less than 110cm. Both of these measurements are far less than DfT guidelines (Local Transport Note 2/08) for the minimum width of shared use cycle paths. 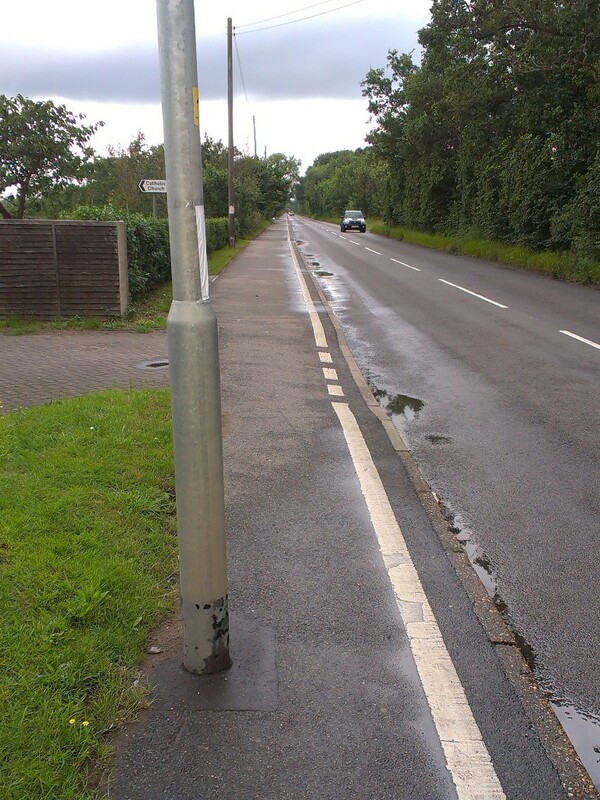 I have therefore contacted Norfolk County Council Highways to enquire how the lamp column came to be installed in such a poor position and what can be done to improve things now. I’ve now had a comprehensive reply from Norfolk County council. Apparently the column was supposed to be positioned off the cycle path, but when the contractor came to install it, they discovered some underground services in the way. As a result, the column location was moved. The council say they weren’t consulted about the move, and are investigating whether it will be possible to move the column back off the path. If not, they say that they’ll try to make it more conspicuous. As part of a longer bike ride, I returned to Thetford along Regional Route 30 from Watton. Part of this route is off-road along the Peddars Way. The surface is mostly pretty good for cycling, and would be fine with a hybrid bike. However, one section adjacent to Thompson Water is prone to flooding, and was almost impassible today. I was only able to pass by squeezing up the bank on foot and leaning inwards on my bike while wheeling it through the water. The water probably wasn’t that deep for a bicycle, but given the size of the flooded area and being unable to see the state of the ground beneath, people shouldn’t be expected to try to cycle through. Walkers would also be reluctant to try to wade it, and the water in the middle would probably overcome most walking boots. I’ve previously reported this issue to Norfolk County Council (the route is a Public Footpath, which they have a duty to maintain, at least for walkers), but nothing seems to have been done. 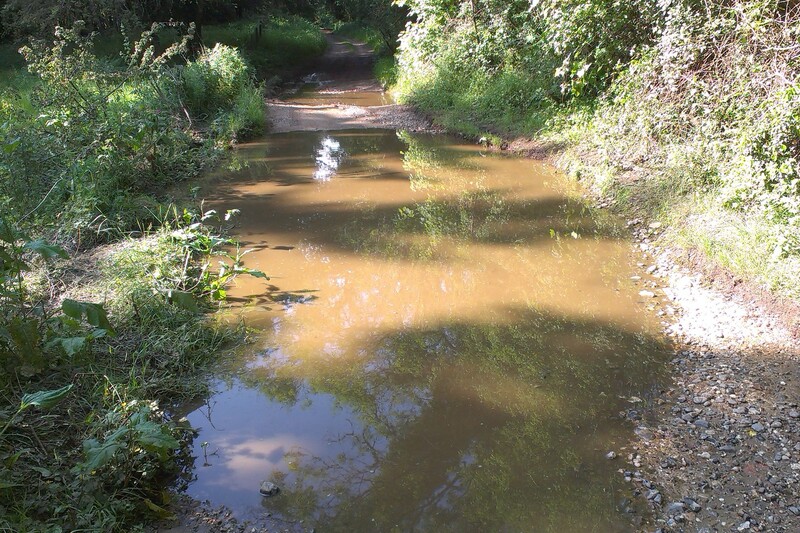 I’ll also contact National Trails, since the problem lies on both the Peddars Way and the Peddars Way Cycle Route. If the flooding issue cannot be addressed, we will probably need to look at diverting route 30. It would be a shame not to be able to make use of the otherwise pleasant Peddars Way route. I am aware of the situation along that section of the Peddars Way. Indeed I carried out some surface work there in the past. 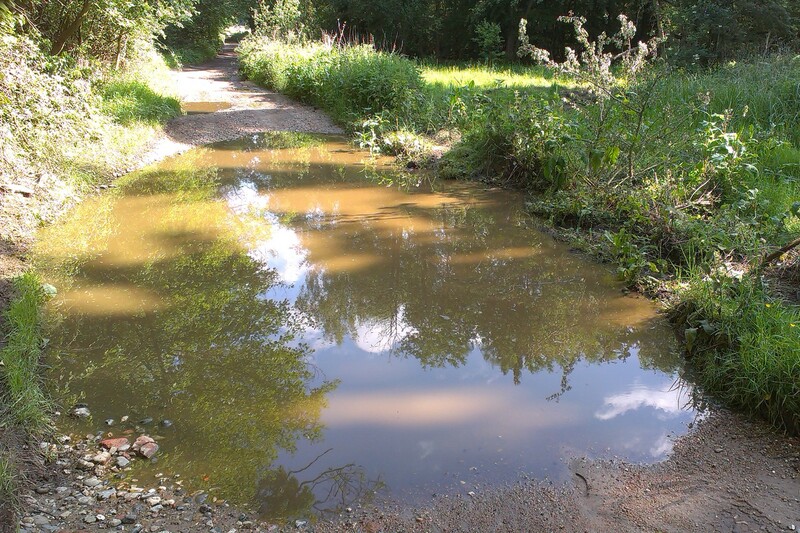 Whilst my priorities are for walkers along this section, I can inform you that I have allocated a moderate budget to alleviate the flooding this year. As soon as our prioritised work load allows we will be delivering this work. Although I cannot confirm an exact date at this time, please be assured I plan to complete this before the autumn. 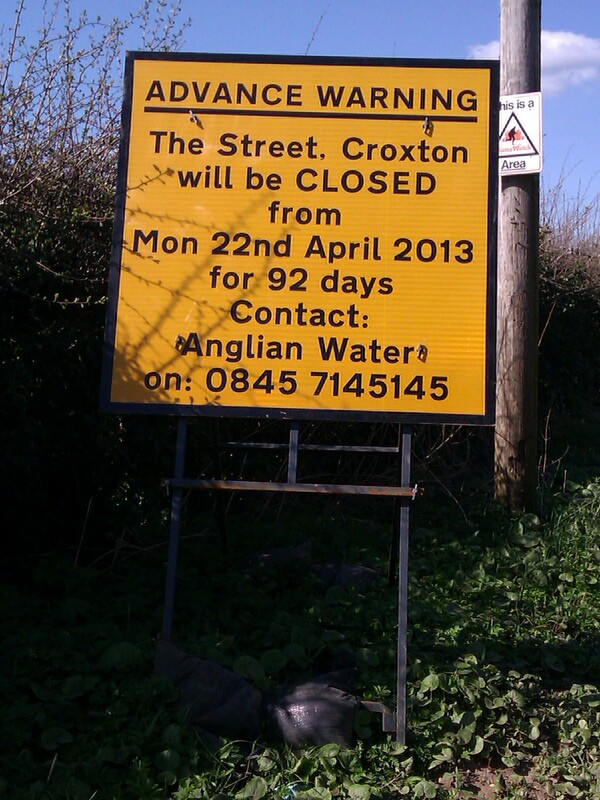 So perhaps we will not need to divert the NCN route after all. I rode this section of the Peddars way today, and it looks like the proposed works have been carried out, as the flooded section was now dry. See this post.